junction with a long view axis towards the main road. An L-shaped building layout plan creates a private garden at the rear corner of the site. The building mass cradles this inner sanctuary, with views from the living and kitchen spaces on the ground storey centred towards the green landscaping. The combined living and dining room has the spatial experience of an open pavilion, with the natural elements of water on one side and green landscaping on the other. A 3.6m high teak timber ceiling allows maximum light to enter the living spaces and excellent natural ventilation when the glass sliding doors on each side are opened. As a result, the house is infused with light and air, allowing for a pleasant living experience in Singapore’s tropical climate. 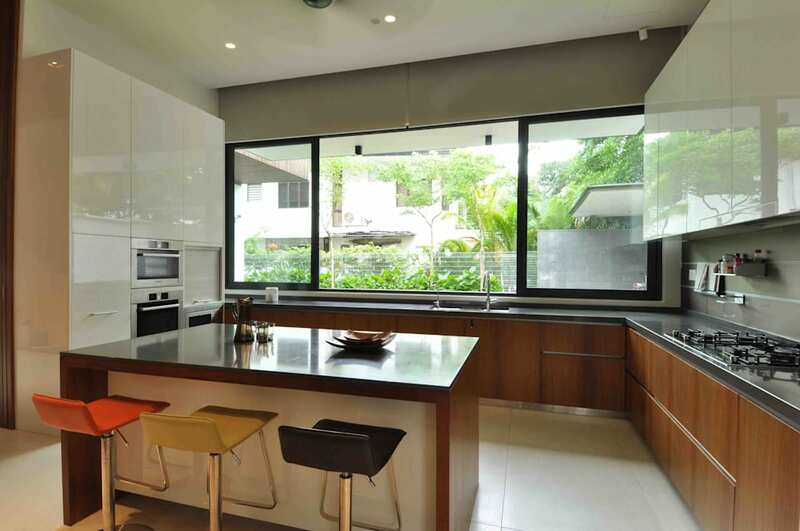 Rain is kept at bay with a large overhanging aluminium roof which also provides ample shade in the hot afternoons. A fully-floating feature staircase ties the two stories together in a double height volume, lined with 8m high off-form concrete walls. Borneo Ironwood timber is utilised on the second storey building façade to insulate the bedrooms as well as to break down the building mass. At the owner’s requests, the timber strips are untreated and allowed to weather naturally, creating a personal, alluring quality to the house.